Sweet potatoes are made up of complex carbohydrates – long chains of sugar molecules (polysaccharides). When eaten, carbohydrates break down into glucose (sugar) – the body’s main energy source. When glucose is released into the bloodstream it signals the pancreas to make insulin, which helps move excess glucose (that isn’t needed right away for energy) into muscle cells. Glucose is the main source of fuel for your brain, central nervous system and muscles. That’s why skipping out on carbohydrates can make you feel sluggish! Any glucose the body does not use immediately is stored in the muscles and the liver as glycogen. As exercise intensity increases, muscle glycogen is used, which causes a greater need for carbohydrates. Experts suggest fueling your body with carbs before physical activity and consuming carbs and protein after physical activity. The key is to balance your body’s activity level with the right amount of fuel. Carbs are the fuel and protein is what rebuilds and repairs muscles (though building and repairing muscle is an energy expensive process, it requires a lot of calories). Getting carbs into your system is vital post workout to help replace stored energy (glycogen) that was lost during exercise. This energy is used during your next bout of physical activity. When eaten with the skin on, a medium sweet potato has over four times the recommended daily intake of vitamin A – which plays a vital role in vision, bone development and immune function. Vitamin A is a fat-soluble vitamin, so be sure to eat your sweet potato with a little bit of fat, like sour cream, for maximum vitamin A absorption. Vitamin A also acts as an antioxidant, which has been shown to have a protective effect on cells. 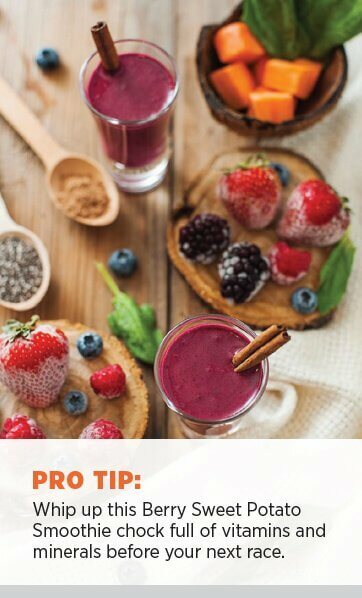 This is especially important for athletes because exercise produces free radicals. Excess free radicals can damage cells. 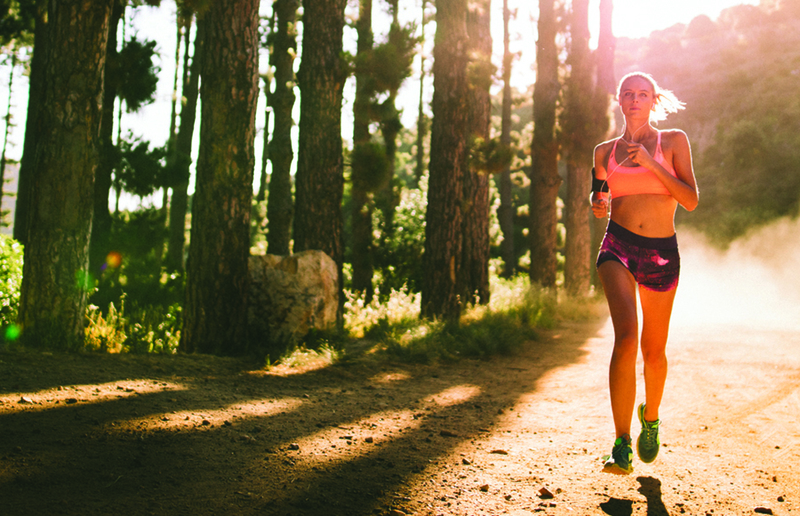 Whatever fitness path you choose – triathlons or simply enjoying the outdoors on a walk – sweet potatoes should be an integral part of your health and fitness journey. For more sweet potato tips, recipes and inspiration, we encourage you to explore our website. 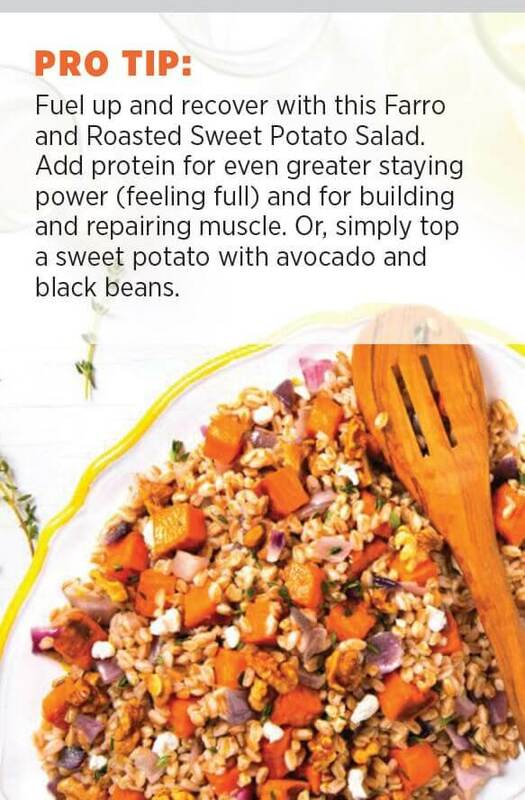 If you’d like to download or print this information, please click here for a downloadable “Sweet Potatoes Keep You Moving” resource. 1. Powers SK and Jackson MJ. Exercise-induced oxidative stress: cellular mechanisms and impact on muscle force production. Physiol Rev 88: 1243-1276, 2008. 2. Thomas DT, Erdman KA, Burke LM. Academy of Nutrition and Dietetics, American College of Sports Medicine, and Dietitians of Canada. Position of the American Dietetic Association, Dietitians of Canada, and the American College of Sports Medicine: Nutrition and Athletic Performance. J Acad Nutr Diet 2016;116(3):501528. 3. Beard J, Tobin B. Iron status and exercise. Am J Clin Nutr 2000;72(2), 594s-597s. 4. Kim J, Lee J. A review of nutritional intervention on delayed onset muscle soreness. Part I. J Exerc Rehabil 10: 349-356, 2014.